The sector shrank by 3.9% in August, catching the City off-guard. 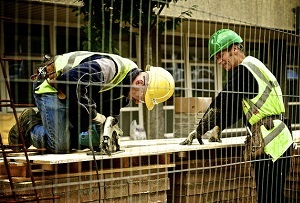 Analysts were surprised to discover this morning that Britain's construction sector shrank by 3.9% in August after most predicted it would grow slightly. The dip follows growth of 1.9% in July, the Office for National Statistics announced. Year-on-year output fell by 0.3%, the first yearly decline since May 2012. Construction accounts for more than 6% of Britain's GDP, so the figures are pretty terrible new for Britain's broader prospects. 'This will affect GDP. Depending on the scale of the bounce next month, this could subtract around 0.1 per cent point from overall GDP growth,' said Alan Clarke, head of European Fixed Income strategy at Scotiabank. The fall was driven mainly by a slump in work on private housing, although all types of new work, including infrastructure and commercial property, fell, except for new public housing. Early indications from analysts Markit Economics suggest that September was much more fortuitous for builders, with its construction index rising by the second-highest amount in seven years.